Pro-Line adjustable battery strap for Slash 2wd/4×4 « Big Squid RC – RC Car and Truck News, Reviews, Videos, and More! 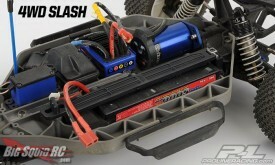 Pro-Line has a new adjustable battery strap for the Slash and Slash 4×4, let me tell you about it. Well first of all, it’s a battery strap, it’s also adjustable, and it’s made for both the Slash and Slash 4×4. Also, it’s blackish in color and … did I mention adjustable? I guess the main point of this whole deal is that it’s not the stock battery strap and it is adjustable for use with larger batteries. So if you have issues with your current battery strap and it’s non-adjustability, this may be the answer you’ve been looking for. The strap is available now for $29.95, check out the Pro-Line web site for more info.